I'm always on the look out for new (and interesting) wine blogs. This morning, I stumbled upon a fairly new one worth keeping an eye on: cultured wino. 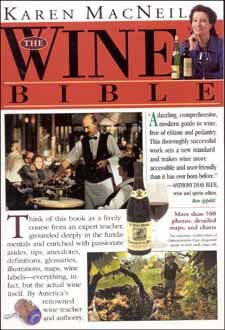 From what I've read already, I like and can appreciate how Tiffany (the owner/writer) looks at wine and the wine world. "And that’s the problem so many have with wine and wine drinkers. Like jazz, cigars and single-malt scotch, wine comes with the baggage of class — or, rather income. As soon as people get a little bit of change in their pockets and some “exposure to The World,” they start to drink wine and then adopt the snooty cool pose that goes along with it. After all, people with money are all wine-drinkin’ snobs, right? I think there needs to be a wholesale change in the way companies market wine and the groups they target." Anyone who is anti-snob is okay in my book. If you like reading LENNDEVOURS, please head over to cultured wino and see what she has to say...I expect we'll all see some great commentary. Devoted LENNDEVOURS readers, fear not! I haven't posted in quite a while, but that's only because I've been (and remain) out of town for the holidays. I'll return later this week...and I've got lots to post about. I've eaten some great meals and tasted some great wine (and some that were mediocre at best). Stay tuned...and check out the site this weekend. Such words have been uttered by many an award loser over the years. But, in the case of LENNDEVOURS' nomination in the "Best Food Blog - Wine, Beer and Spirits" category in the 2004 Food Blog Awards , it's true. I'm honored and humbled (can you believe it?) that enough people enjoy my writing to get this lil ole blog on the balot. Thank you everyone. So I ask you...my faithful readers...if you enjoy my writing and adventures in the wine world, head over to The Accidental Hedonist (the awards' creator) and vote for me! The ballot is in the right column. There are some great blogs listed in all the categories. If you haven't checked them out, you definitely should. The competition is is stiff...but, again, it really is an honor just to be on the ballot. 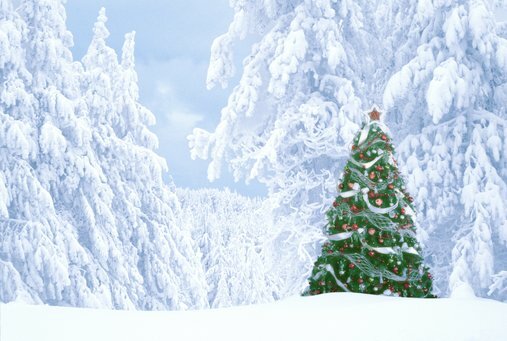 Here's to a happy holiday season to all of my readers and fellow bloggers around the globe. I hope that your Xmas (if you celebrate) and New Years celebrations are filled with great food and even greater wines. And by all means, post about it so we can all see! It's been one hell of a fun year, and I'm sure 2005 will be even more so, with LENNDEVOURS' birthday in the late winter, my 30th birthday in April and, of course, my wedding to Ms. LENNDEVOURS herself, the lovely and tolerant Nena. I guess that will make her MRS. LENNDEVOURS then, huh? Nena and I leave Thursday afternoon for Pittsburgh to celebrate Xmas with my family. We'll be enjoying my mom's lasagna Xmas Eve...and enjoying good food and wine at my aunt's on Xmas day. Of course Nena and I will be bringing our wine suitcase...probably filled and beyond. We'll also be having dinner with my aunt and Randy Sunday at a new area restaurant, Siba. Pittsburgh is a bit of a culinary wasteland...so any new restaurant that isn't a chain and that is doing something "new" is worth checking out. And, before dinner there, we'll be at my grandparents to watch the Steelers kick the crap out of the hated Baltimore Ravens. When someone says “Long Island wine,” what comes to mind? Cheap, syrupy-sweet blends and blush? Over-priced plonk from large producers that is more hype than heaven? Well…you’re right, but not completely. While there are plenty of wines out east that fall into those two, less-than-complementary categories, there are almost as many that don’t. Visit the right wineries and try the right wines, and you’ll find delicious, bright Chardonnays that are far from California in style but not quite Burgundian either. Merlot, as you’ve probably heard, does exceptionally well in our Bourdeaux-esque climate. Cabernet Franc, in my opinion, does almost as well in the hands of good winemakers. 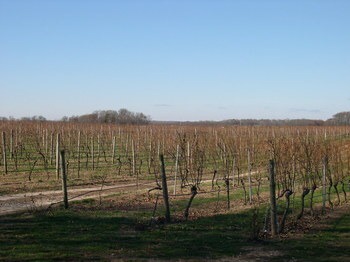 Stick to some of the western most vineyards on the North Fork and you can even find full, ripe Cabernet Sauvignon, too. Wade further through the quality wines and you can even find spectacular, high-end pours that are worthy of a spot in your cellar – right alongside wines from Bordeaux, Burgundy and California. This week I did a story that included some of Long Island's "high-end" wines (in terms of price)...and it required quite a bit of tasting in a short period of time. But...there were some great wines in the lot (and some that were quite overpriced). I'll post the story once it's published (tomorrow morning), but here's a few of the pictures I took for it. One of the things that can be tough about living in one place (Long Island) when your parents live somewhere else (Pittsburgh) and your fiancee's parents live in yet another place (Near Albany) is making sure that you see everyone for the holidays, not to mention the transportation of gifts to and from various locales! Despite the extra effort...there are some pay offs. I've already posted about my wine fridge, an early gift from my parents that was easier to have shipped directly to me (instead of wedging it into the backseat of our car on the way back to Long Island). Last weekend, we visited Nena's parents to celebrate Xmas with her parents, grandparents, siblings, step-siblings...the whole crew. 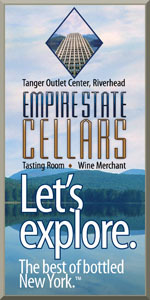 We had a great time...and got some great gifts...several of which are wine related! I got a couple wine books I've wanted for a while (pictured right), some new every day globe wine glasses and some very cool European-style white wine glasses that my future in-laws first discovered in Italy in October. Picture this: it’s the 1970s and IBM sends you to Kuwait, a country where you couldn’t buy alcohol, to live and work for seven years. What do you do for fun? 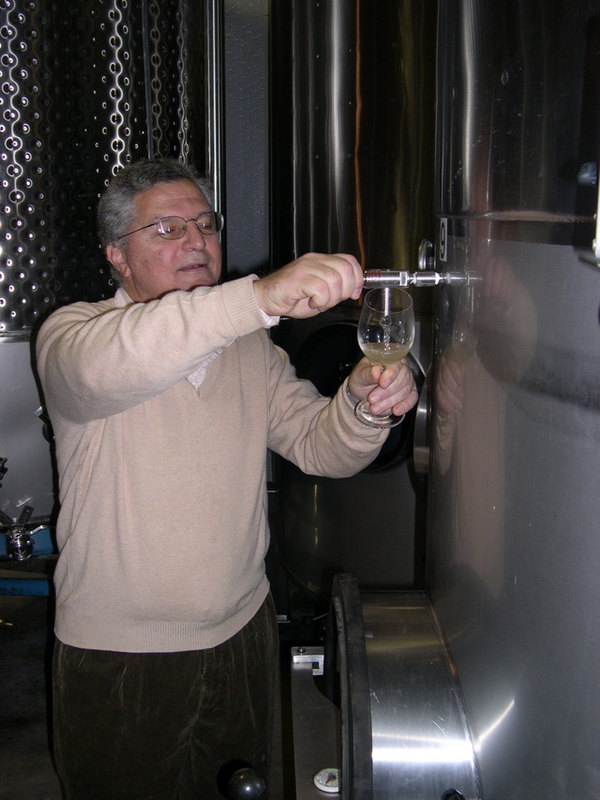 If you’re Charles Massoud, co-founder of Paumanok Vineyards, you learn to make your own wine – and then later decide to make winemaking a second career, along with the help of your wife Ursula, who comes from a German winemaking family. Recently I discovered a cool website PoppingCorks.com that compiles wine reviews from all over the place into one site. You'll find reviews from major newspapers, small newspapers and even some of your favorite wine blogs. Of course by promoting it I'm being a tad self serving. This afternoon they started including my wine reviews as well. The inclusion of bloggers if very forward thinking and PoppingCorks.com should be applauded. I think people are sick of having major wine publications as their only source for wine information. I know I learn much more reading wine blogs...because I can easily relate to the writers and, without the pressure of writing for glossy magazine that is largely interested in selling advertising, bloggers can be much more honest and unbiased. I drink a lot of New York wine, particularly from Long Island. It's right in my own back yard and over the past few months I've developed some nice relationships with some of the GMs and winemakers in the region. I think it's always fun to drink a wine when you know the people behind the scenes. Originally, I had wanted to have a few people over to taste each of the wines, side-by-side, to get an overall feel (taste?) for SR's winemaking style. But, I quickly reminded myself that I don't have such a set of friends...so it's up to Nena and I. 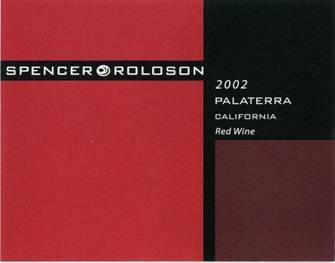 Last night, we opened the first of the batch, their 2002 Palaterra Red Table Wine. It's a blend of 33% Carignane, 33% Syrah and 33% Valdigue. Carignane and Valdigue aren't grown here on Long Island I don't think and most of the Syrah I've had here tends to taste unripe...and probably only gets made because it's a hot-selling varietal these days. Back to the Palaterra. The Carignane and Valdigue vines that produced fruit for this blend are 65 and 50 years old respectively...another characteristic I just can't find on Long Island...the region is only 30 or so years old! All the vines are grown in cobbly soils and dry farmed. The yields are low, chich produces intensely concentrated and colorful fruit. 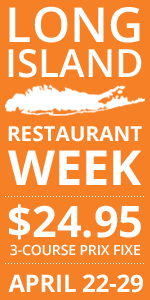 Brix at harvest was much higher (24.5 - 26) than what's typical on Long Island (22 - 23). That's mostly a result of our shorter growing season. In my morning wine-related Web surfing, I stumbled upon an amusing wine calendar from Bob Johnson, a Bay-area designer. Check it out...I'm thinking of ordering one for my cube here at the ole day job. A couple months ago, I edited/reviewed my friend Tracy's doctoral thesis for her. After almost putting me asleep with her piles of information and research projects on Achille's tendon injuries...she figured she owed me. I wouldn't accept cold cash...so she decided to send me some wine instead. 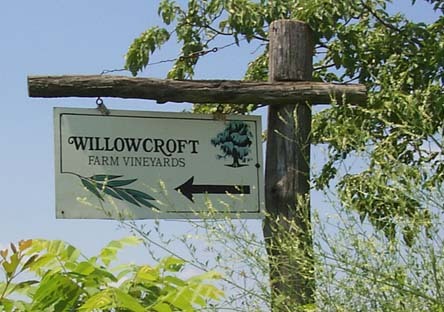 This bottle of 2001 Willowcroft Vineyards Cabernet Franc was the first I opened--my first wine made in Virginia. 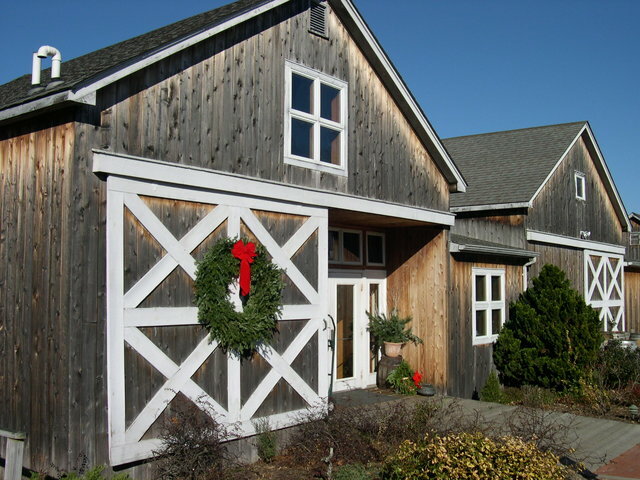 Macari Vineyards, located on Sound Avenue in Mattituck, has always been one of my favorite destinations for East End wine tasting. 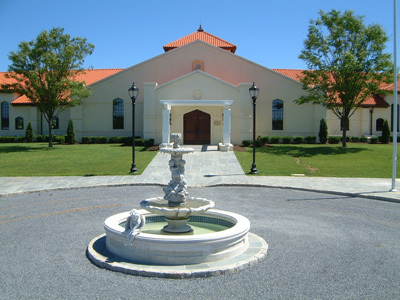 Its modern, elegant tasting room and spectacular vineyard views are almost as welcoming at the people who pour the wines. With tasty wines that are organized into ever-changing flights, I’ve never had a bad experience at Macari – from the people or the wines. Despite becoming increasingly well known for its high-end reds, including Bergen Road 2001 ($40) and Alexandra 2000 ($75), as well as its Rose ($12, voted Dan’s Papers’ “Best of the Best” Rose), Macari has two new, deliciously charming (and affordable) whites worthy of any wine drinker’s attention, as well as an upcoming Merlot release to keep an eye on down the road. 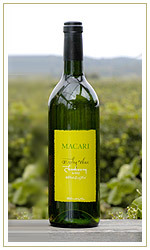 Lauded in the November 21 issue of the New York Times, Macari’s 2004 Early Wine ($13) is a tantalizingly unique white that I challenge anyone not to fall in love with. Made from 100 percent Chardonnay grapes that were picked September 20, it was bottled October 16 and released October 29. Nearly colorless and just perceptibly fizzy, this dry wine floods the palate with bright citrus fruit and crisp apple. 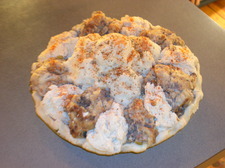 Lush and extremely food friendly, I poured it with Thanksgiving dinner and it was a big hit among wine lovers and novices alike. This is truly one of the freshest wines around, both in terms of age and taste. Available now in Macari’s tasting room, try it with most any meal that doesn’t include a slab of red meat. Buy a case. Drink it yourself or give it as holiday gifts. You won’t be disappointed. 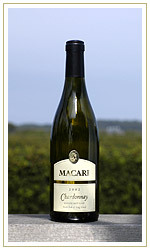 The 2003 Estate Chardonnay ($12) is a well-made, citrus-driven Chardonnay with excellent balance and grace. Clean and a little minerally, with just the most subtle hints of creamy toastiness, this is an affordable example of what I consider Long Island-style Chardonnay. Serve it before dinner, with most any seafood or with lemon pepper chicken. It’s scheduled to be released in mid-December. Macari’s 2002 Estate Merlot ($15), also expected to hit shelves pre-Christmas, isn’t nearly as refined or ready. Young tasting and still slightly astringent out of the bottle, its tannins did mellow some with decanting, but they still overshadowed much of the wine’s fruit. The 2001 vintage was a great buy at the same price, so “upon further review” this vintage could be a winner as well. I’ll let you know when I try it again in a couple months. Ryan at VineSugar, has a great post on his site today that points to an article in the Philly Inquirer about Pennsylvania's seriously outdated liquor laws. Ryan is a PA native. I'm a PA native. We both remember the pain of living under the evil regime...and we're both thankful for living in other states now. PA may have voted for John Kerry (a big plus), but PA has some of the worst liquor laws in the country. I know people that have resorted to buying cases of "olive oil" from California wineries...just to get some decents wines for their cellars. At least we're not Ohio. To the Supreme Court...lift the ban in interstate shipping. Consumers will win big...throughout the country. After a one-week hiatus, you can read me again in Dan's Papers this week. 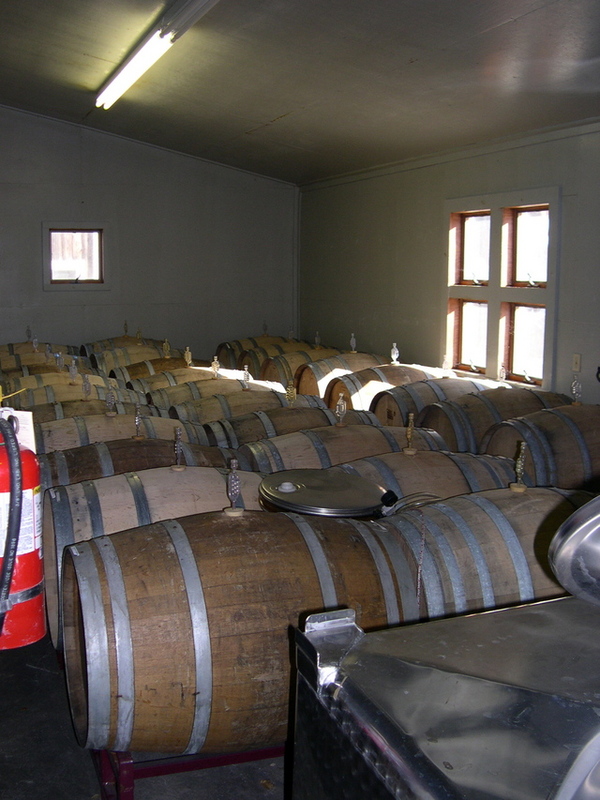 My column, Over The Barrel...With Lenn Thompson, this week focuses on Macari Vineyards and some of their recent and future releases. Raphael's focus is on Merlot--considered by many to be the varietal Long Island is best suited for (there will be many future posts on this topic). They also make Sauvignon Blanc (which is quite good), Saignee (a Rose) and have a recently released Cabernet Franc...but again, Merlot is their focus. This week, Raphael's managing director and winemaker, Richard Olsen-Harbich, sent me a couple bottles of their 2000 First Label Merlot, their flagship wine. It's 97% Merlot and 3% Cabernet Sauvignon, spent a year in French oak and was 100% hand harvested. Brix at harvest was 23.7 (Cali wine afficianados will note that LI's typical brix is lower than theirs). Because the Bloggies have ignored all of the Web's amazing food/wine blogs, the Accidental Hedonist has decided to host some foodie blog awards of our own. I can't think of a better idea. And, most importantly (warning, shameless plug), I've been nominated in the Best Food Blog - Wine category. Your nomination can only help...don't turn me into he guy that says "Its an honor just to be nominated" (even if it is). Selflessly, I nominated Alder at Vinography...but mostly because I'm not one to actually nominate myself. I'm working on a post/column on my trip out to Paumanok Vineyards last weekend. But, I wanted to share some of the pictures now. Wolffer Estates, in the Hamptons region of Long Island, is probably one of my favorite two or three producers in New York State. From their bone-dry, mostly-Merlot Rose to their full-flavored Cabernet Franc to their succulent Late Harvest Chardonnay dessert wine, and all the wines in between, I've never had a Wolffer wine that I'd call "poor." Roman Roth, their winemaker and general manager, is nearly magical in his ability to craft delicious wines year in and year out. He's so good, in fact, that several other wineries on the Island have him make (or consult on) their wines. As much as I like their wines, one was always just out of my reach -- the Premier Cru Merlot -- because it's prohibitively expesnive for my pre-wedding day budget, checking in at over $100. I'm still trying to write up the recipe...but I just had to get this picture of my future mother in-law's turkey pot pie posted. It is an amazingly inventive way to use Thanksgiving leftovers (it's actually pretty involved if you don't already have stuffing, mashed potatoes and turkey around). 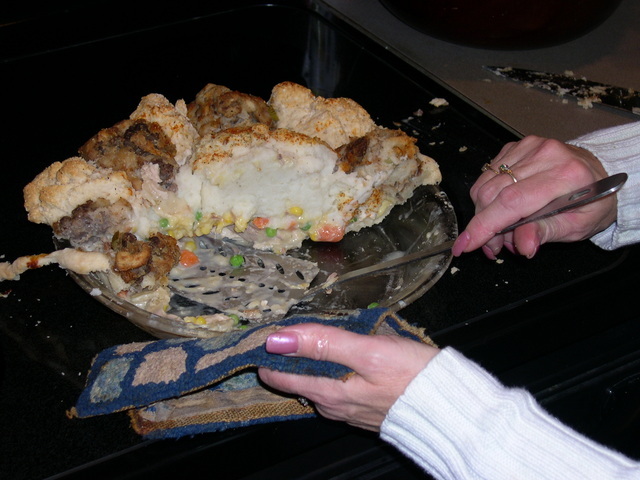 I'll hopefully get the recipe written up soon, but what really sets this pot pie apart from the norm is the top "crust." Instead of using the same crust you use on the bottom, it's topped with scoops of stuffing, mashed potatoes and unbaked biscuits. The best part is that it's her own invention. She just thought it up one day. After asking for information on Valdiguie toward the end of a recent post, I decided not to be lazy and to research it a bit myself. It turns out that it's also known as Napa Gamay...and is a variety from southern France. The full name of this French red wine grape is Gamay Noir a'Jus Blanc. Gamay wines have gained prominence in France's beaujolais region where this grape, which represents 98 percent of all vines planted, reigns supreme. They're so associated with Beaujolais that winemakers outside of the region often try to imitate the style of immediately drinkable, light- to medium-weight wines with high acid and low tannins. These light purple, fruity wines suggest flavors of bananas, berries, and peaches. Gamay is grown in other parts of burgundy, such as the côte chalonnaise, where a blend of pinot noir and not more than two-thirds Gamay is known as bourgogne passe-tout-grain. 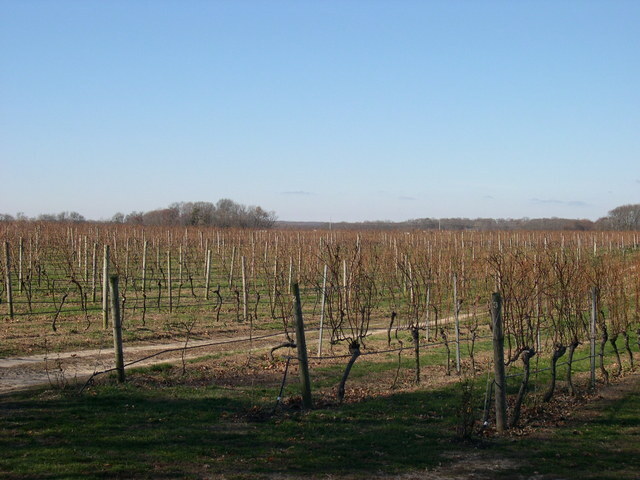 In the loire anjou produces Anjou Gamay, and from touraine comes Gamay de Touraine. There is very little true Gamay cultivated in California. For years California vintners grew what they thought was true Gamay Noir a'Jus Blanc, calling the resulting wines gamay beaujolais. However, this "Gamay" was eventually identified as an unexciting clone of pinot noir. California's napa gamay is another case of mistaken identity. It too was thought to be a true Gamay, but has since been recognized as Valdiguie, a variety from Southern France's languedoc-roussillon region. The wines produced from both these grapes are light- to medium-bodied and made in a style similar to true Gamay from Beajolais. Because of historic practice, both California wines are sometimes still called Gamay Beaujolais. blaufränkisch, a variety grown in Austria is also sometimes mistakenly called Gamay. 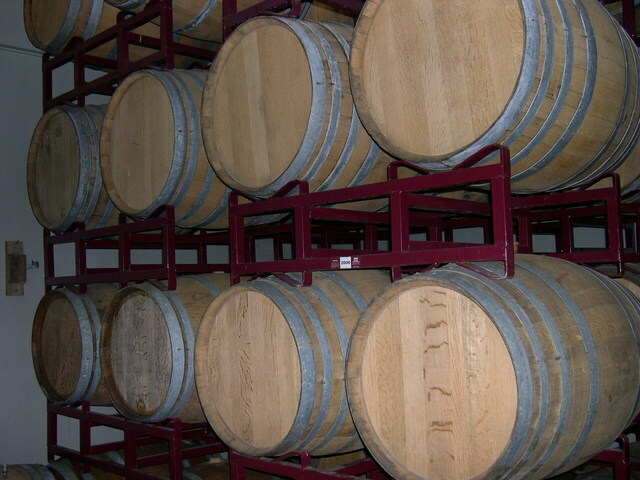 Other names for Gamay include Bourguignon Noir and Petit Gamai. Holiday season got you feeling a little...wacky? Pim from Chez Pim has just the thing...Wine Blogging Wednesday #5 -- Wacky-Names Wine. WBW is my own little creation (with a tip of the had to Alberto)that has quickly grown into an International Phenomenon! Okay...maybe two dozen participants in last week's fourth edition (hosted by Derrick at An Obsession With Food) doesn't qualify as taking the world by storm...but we're getting there! We're building momentum...thanks to the hosting of some blogging heavy hitters like Derrick, Alder and Viv. And, it's great to add another popular blogger, Pim, to the list of gracious WBW hosts. Her theme is simple. Go out and find the wackiest named wine you can...drink it...and tell the world about it on January 26th! Pair it with food. Compare your own impressions to the "official" tasting notes. Just give it a thumbs up or thumbs down. Have fun with it...remember, we're all learning about wine...and always will! So head over to Chez Pim to get all the details. We'll "see" you on January 26th! This year, instead of buying gifts for EVERYONE in my family (and vice versa) we picked names...and my dad got me (and I got him, despite a little confusion haha). 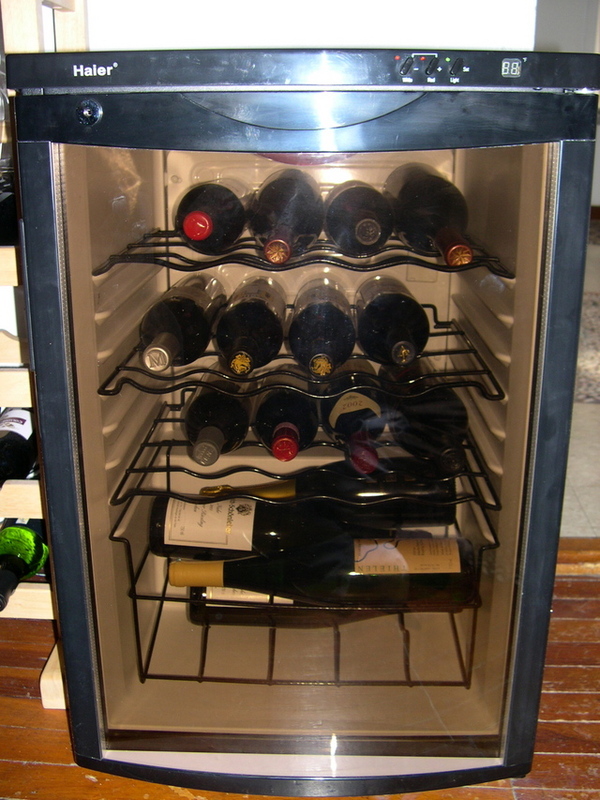 Well...my gift from my dad arrived a little early (yesterday) but I couldn't be more excited with it...my first wine fridge. Of course now my regular wine rack is looking a little empty (relatively)...so I guess I need to buy some more wine, right? Derrick has posted a round-up of this month's edition of Wine Blogging Wednesday -- New World Riesling. This month, we had two full cases of participants (that's 24!) 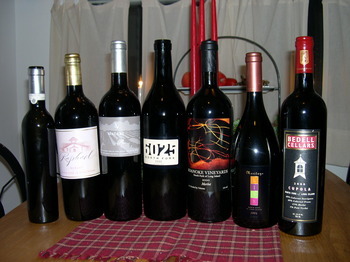 and over 30 wines reviewed total...from New York...to California...to New Zealand...to Australia...even to MARYLAND! Great theme (thanks Derrick) and thanks for hosting. Keep an eye out for the WBW #5 annoucement soon...it's a little bit of a different spin on WBW...and comes from yet another SF blogger!